I respectfully disagree with former president Haglelgam. He does not see the value in dual citizenship, but I’m sure his grandchildren will differ in their opinion once they reach the age of 18 in the US. By the way, it is not as easy as he makes it sounds to renounce your US citizenship. It can be expensive and the US government may restrict you from entering the country once you renounce your citizenship. Honorable Haglelgam claims only a small group will benefit from dual citizenship. Well, that number is not as small as it may have been when he was president and continues to grow everyday. I’m not going to get into the exact numbers, but about a decade ago the estimate was over 30,000 Micronesians living in the US and the number continues to increase due to the mass exodus in recent years. Some estimates are as high 70,000 people from the COFA countries that are currently residing in the United States. That is a pretty significant percentage of the population that would benefit from dual citizenship. I understand President Haglelgam’s opposition to the initiative but there are a countless number of grandpas and parents back home that do want to leave their land that may have been brought down through generations to their US born kin. Many Micronesians left their home island in search of work, education, or for health reasons. Many have settled in the US with their children or grandchildren in the hopes of someday returning to help and contribute to the development of their homeland. Many have joined the US military for similar reasons and have been limited to moving up in ranks due to restrictions on higher security clearances. President Haglelgam explains, “Is it worth enacting a dual citizenship for these people and risk allowing foreigners who are able to acquire dual citizenship for the FSM and their respective countries to own land in our country?” To my understanding as the law stands, a foreigner with no FSM blood can become an FSM citizen through the naturalization process so how would the dual citizenship favor someone who can already access the path to citizenship. The dual citizen initiative is intended to allow persons of FSM heritage (blood) to hold two passports. Aside from the naturalization process to become an FSM citizen, at least one of your parents must be from the FSM and you need to obtain your passport by the age of 21. Dual citizenship will enable someone of FSM heritage, whether they serve in the military and elect to get their US passport or whether they have US born children who would benefit from programs that their host country offers, without risk of losing their heritage. On a slightly different note, but related, I’ve always felt our compact with the US allowing our young men and women to join the US military conflicts with our own FSM constitution which doesn’t allow allegiance to any other country. In simple terms we allow our citizens to die for the United States of America but if they become a citizen of the US they risk losing their heritage back home. Micronesians are one of the least represented islander groups in the US and having dual citizens to represent us without recourse from local governments whether in Guam, Hawaii or even at the federal level would be beneficial to all Micronesians. The Marshall Islands and Palau have dual citizenship and appear to be progressing yet holding on to their culture and nationalism. Islanders by nature are proud and have no issue with identity. Our greatest resource is our people so give them incentive to return with their families and contribute to our islands future. I’m for dual citizenship especially during this time of uncertainty with the fast approaching compact negotiations and the present U.S. administration’s hard stance against immigration. 1) Under what terms or provisions of the Compact or the US Public does it state that COFA citizens are “not eligible to apply for naturalization to become US citizens” as John claims? Without proper citations of the relevant laws or provisions, Iʻm afraid I canʻt just take Johnʻs words for it even as respectable a leader as he is as a former president of our nation. 2) What type of “visa” is he referencing for COFA citizens to apply for to enter the US when we only need our passports to enter the US? I know that citizens of other non-COFA nations have to apply for a travel visa to come to the US. Is he using that kind of scenario to mislead COFA citizens? 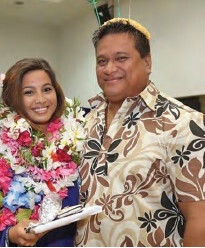 As I leave for college abroad, I can’t help but want to declare to Pohnpei and the FSM, a world of thanks & gratitude and my admiration to the man I call DAD, Ipa, my father, and Congressman Ferny S. Perman. Less than two short years ago, Pohnpei Election District 1 elected my dad, a political unknown compared to his colleagues, to be their representative in the Federated States of Micronesia’s Congress -- a mighty feat because it was only after his third attempt that he won. From humble beginnings, my dad was born in Pohnrakied, Pohnpei in the summer of 1965 to Judy Shoniber Perman and the late Francisco Perman. He was raised in Mwalok, Sokehs. As a firstborn son, he bore many responsibilities at home with the farming, the clearing of the land, helping with his younger siblings, and his all-time favorite, fishing. At an incredibly young age, he was so fascinated about fishing, that his father gifted him with a locally-made canoe to experience the ocean and take on new adventures. An avid fisherman today, he developed his love of fishing in this canoe.